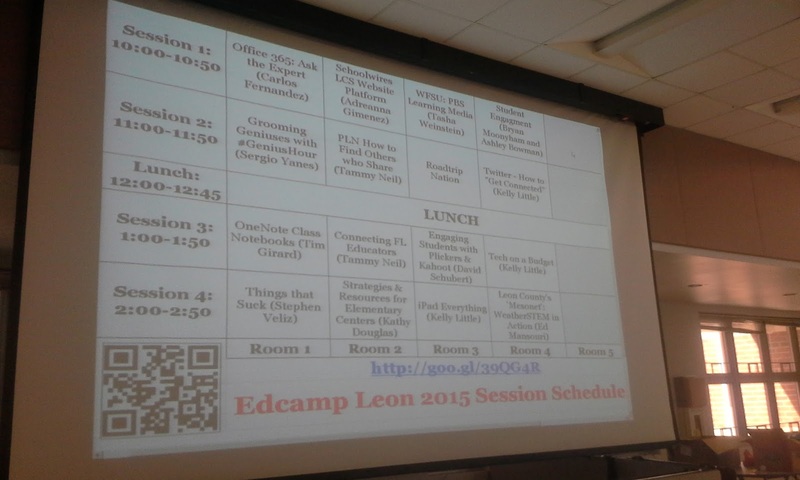 Today, Leon County hosted its third annual EdCamp, and I'm so glad I was able to attend again this year. 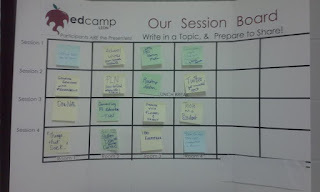 Like my other EdCamp posts, I'm simply going to share what I participated in throughout the day. Registration lasted an hour, from 9:00-10:00 a.m. When I arrived, I noticed a few coworkers, but I also recognized the friendly face of a teacher I know in a local public school. We have sort of a history together (I taught his child and have also worked with his wife). He soon approached me and asked if I'd like to present with him today about student engagement. At first, I said, "Don't teachers already know about student engagement?" To which he responded, "Do they??" I said, "I think everything I would have to share, most teachers already know." He reminded me of the Whole Brain Teaching techniques I use, plus my chants/singing/dancing, Mystery Skype, classroom transformations, etc. He's observed my teaching. Finally, I decided I would present with him. I wasn't really prepared, but he assured me it would be more conversation-style than true presentation-style. Within 15 minutes, we were standing in front of our audience. Just ignore the misspelled words. 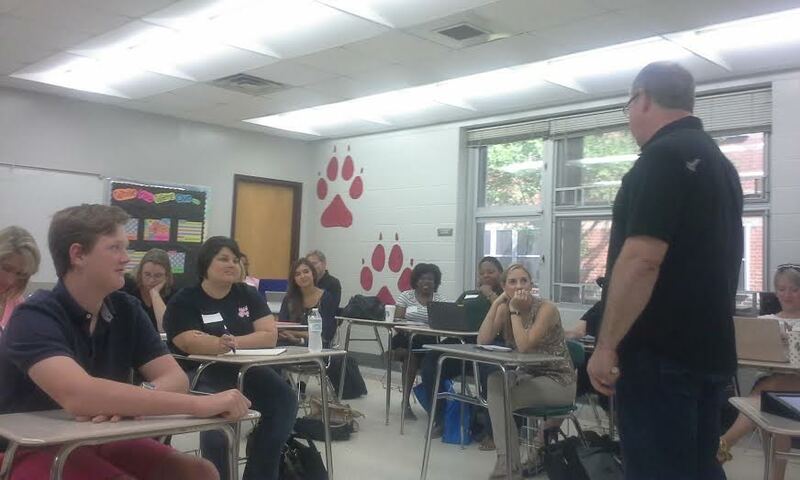 I didn't type the schedule, but I assure you, we were sharing about "Student Engagement," not "Student Engagment." I was kind of surprised when we went to our room--every seat was full and we needed to pull in more chairs. Apparently, more teachers than I thought are interested in student engagement! Bryan mainly led the conversation, but I jumped in and shared when I felt like it. There was a great flow to the presentation, I thought, and many of the teachers shared their own ideas and strategies. 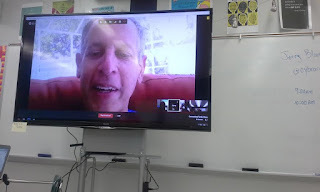 We discussed Bill McBride's Six C's of Engagement, various attention getters, Whole Brain Teaching, Ron Clark Academy techniques, and a variety of resources. We recommended all of Ron Clark's books, Inside the Trenches by Adam Dovico, and Teach Like Your Hair's On Fire by Rafe Esquith. The second session I chose to go to was called Roadtrip Nation. 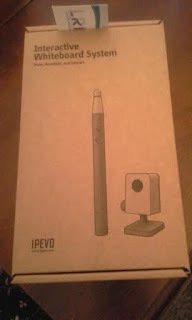 It was a good resource, but really geared more toward upper middle and high school students. Roadtrip Nation is about career exploration, and we looked at several links from www.roadtripnation.org. After the second session, it was lunch time. Salad, pizza, and drinks were provided, and we were all able to talk and share with each other at lunch. I'm so glad we had this networking/sharing time because we didn't last year. Instead, we had to sit through a webcast that wasn't relevant, in my opinion. Today's sharing time was much more valuable. My third session was titled, "Connecting with Florida Educators." 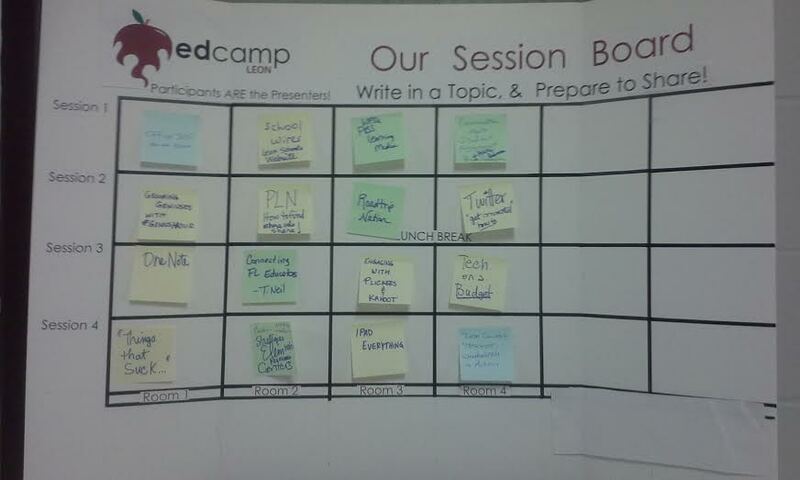 I learned about Google Hangouts, EdCamp Global, and #FLedChat on Wednesday nights at 8 p.m. on Twitter. #cantwait. This session revolved around participating in a Hangout with EdCamp Volusia, the cofounder of EdCamp Tampa Bay, and Jerry Blumengarten. I was a little star-struck when I saw Jerry on screen. I know him as @cybraryman1 on Twitter, so it was fun to get to chat with him for a bit. His online resources have been so beneficial to me, and I encourage you to check out his pages: www.cybraryman.com. He has a plethora of information. Finally, my last session was "iPad Everything" and we were able to share apps/resources and discuss how we use iPads in our classrooms. There were some great prizes offered including a document camera, the IWB Systems, webcams, free registrations to FETC (Florida Educational Technology Conference), Plickers, t-shirts, etc. I believe everyone walked away with something. One final cool thing happened that left me in tears (of gratitude). 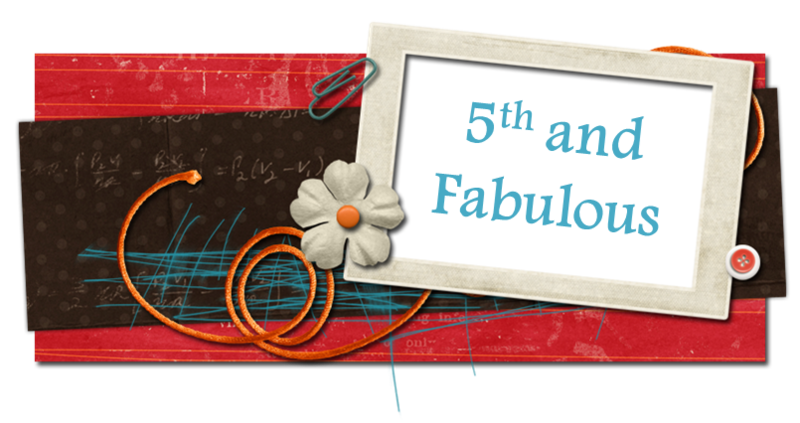 Once the conference ended, I spoke with a lady who organizes the FETC event. Unbeknownst to me, she had come to the presentation I shared in earlier that morning. During our conversation, she referred to my blog and I mentioned that I help with technology workshops at my school. She said, "You need to come to FETC." I told her that I've always wanted to go, but I teach at a private school and we just don't have the funds to send our teachers to a huge conference like that. She invited me to the next conference and gave me a free registration! Tears immediately started welling up in my eyes. As she was pulling out her card and writing the information down, I asked, "Are you really doing this for me?!" I was so excited, overcome with gratitude, and just tried to pick my jaw off the floor! Without going into detail, this past year has been incredibly difficult for me personally. I've had to deal with great disappointment, so when this moment happened, I had a hard time processing it--Is something good really happening to me?! This isn't typical. What's going on?! I'm sure for the average person, my excitement may seem overboard and way too dramatic. 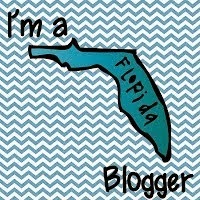 However, I love conferences...I love learning...and FETC is something I've wanted to attend for at least three years. It's one of the nation's largest educational technology conferences. I am thrilled! The conference is in January, and I can't wait to share with you what I learn and experience. It's going to be great! As you can see, EdCamp Leon was another success, and I had a wonderful time!